This particular journey is one i'll never forget ! First of all, my whole-hearted thanks go out to Decadent Publishing and the team of editors for the Western Escape line, those ladies are awesome !!! Their encouragement is what got me involved with Western Escape in the first place. They were having a Shooting Star Writing Contest which I knew nothing about but had this story I wanted to see if would fit into the Freewill setting. The editors there were very helpful telling me all about the town and submission guidelines and said why don't you enter it into the contest? I'd never in my life entered a writing contest so what did I have to lose? I really had no reason not to so i did what was necessary, read through it one more time and submitted the first 3 chapters for judging. Then I had to wait a horrifying month to hear any word and I was in pins & needles. However, to my utter surprise after said month, I got an email telling me I was one of 3 finalists...holy buckets !!! ME?? No way! So now we hurry up and wait another month for the final manuscripts to be read, re-read and judged. Just so you know, I am not a patient person :) They had a set day to announce the winners so marked that on my calendar! Once the official winner announcement day was upon me i was freaking out! I never left my email all day I was so anxious to hear the winners but seriously didn't expect my name to be at the top of the list. My poor kids were sitting at the dinner table when my email alert chimed on my phone. I opened it and proceeded to scream and i swear i just about cried i was so danged excited !!! This is the official announcement on the Freewill blog ! I can tell you I've never been through more thorough edits in my life but all 3 editors are truly wonderful to work with !!!! 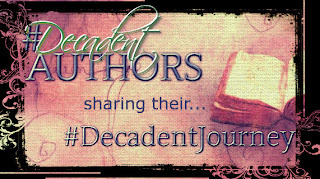 I couldn't be more proud to be a Decadent Publishing Author !!! What a great story about getting into Decadent! Love the cover of your book, too. Thanks for sharing! Thanks C. Moss, I totally love my cover!! The cover artists rock ! Waiting is the worst! lol Luckily Decadent's relatively quick. Congrats on winning - almost as exciting as getting published! Thanks Cate, Decadent is quick and I love that about them. It was definitely an exciting time ! LOL I felt the same way when I got my first edits..is this process never ending? But they taught me so much are much needed. Totally Hales, when I opened that first email i thought oh crap what did i get myself into lol. They are definitely good at their job and I learned alot too ! Ooh I didn't know you won a contest. Congratulations - that's big! and isn't it so hard to wait! Gah. It can be nerve wracking. But glad you made it. Thanks Writery, i was shocked I won. It's awful hard to wait but it was totally worth it ! Congratulations Krista! Love your story, and I love how reassuring everyone is at Decadent. We're truly in good hands! Thanks so much Sara and yes it's a great place to be ! Congrats, so proud of you! Glad you accomplished one of your dreams. I have bought the book.